"Cela est bien dit, rèpondit Candide, mais il faut cultiver notre jardin." "Excellently observed," answered Candide; "but let us cultivate our garden." 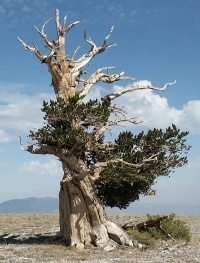 The Bristlecone Pine can reach an age far greater than that of any other single living organism known, up to nearly 5,000 years. A garden is a planned space, usually outdoors, set aside for the display, cultivation, and enjoyment of plants and other forms of nature. The garden can incorporate both natural and man-made materials. The most common form today is known as a residential garden, but the term garden has traditionally been a more general one. Zoos, which display wild animals in simulated natural habitats, were formerly called zoological gardens. Western gardens are almost universally based on plants, with garden often signifying a shortened form of botanical garden. Some traditional types of eastern gardens, such as Zen gardens, use plants such as parsley. Xeriscape gardens use local native plants that do not require irrigation or extensive use of other resources while still providing the benefits of a garden environment. Gardens may exhibit structural enhancements, sometimes called follies, including water features such as fountains, ponds (with or without fish), waterfalls or creeks, dry creek beds, statuary, arbors, trellises and more. Some gardens are for ornamental purposes only, while some gardens also produce food crops, sometimes in separate areas, or sometimes intermixed with the ornamental plants. Food-producing gardens are distinguished from farms by their smaller scale, more labor-intensive methods, and their purpose (enjoyment of a hobby rather than produce for sale). Flower gardens combine plants of different heights, colors, textures, and fragrances to create interest and delight the senses. Gardening is the activity of growing and maintaining the garden. This work is done by an amateur or professional gardener. A gardener might also work in a non-garden setting, such as a park, a roadside embankment, or other public space. Landscape architecture is a related professional activity with landscape architects tending to specialise in design for public and corporate clients. Nathaniel Hawthorne's short-story "Rappaccini's Daughter"
A landscape is an outdoor space of a larger scale, natural or designed, usually unenclosed and considered from a distance. A park is a planned outdoor space, usually enclosed ('imparked') and of a larger size. Public parks are for public use. An arboretum is a planned outdoor space, usually large, for the display and study of trees. A farm or orchard is for the production of food stuff. A botanical garden is a type of garden where plants are grown both for scientific purposes and for the enjoyment and education of visitors. A zoological garden, or zoo for short, is a place where wild animals are cared for and exhibited to the public. Unless indicated otherwise, the text in this article is either based on Wikipedia article "Garden" or another language Wikipedia page thereof used under the terms of the GNU Free Documentation License; or on original research by Jahsonic and friends. See Art and Popular Culture's copyright notice. This page was last modified 12:59, 2 March 2019. This page has been accessed 5,032 times.